Regular readers know of my new research love, www.nyshistoricnewspapers.org. Digitized Geneva newspapers are the quickest way to immerse oneself in a certain year, decade, or century. My steady research love is Wikipedia. Once scorned for reliability, most Wikipedia articles are reviewed and footnoted and have hyperlinks to other subjects. Biases and poorly researched articles are tagged as such at the top of the entries. 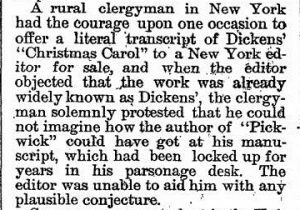 When asked to write about Charles Dickens’ A Christmas Carol I took to Wikipedia and old Geneva newspapers. 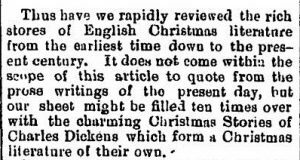 I didn’t know that Dickens wrote five Christmas books in the 1840s. A Christmas Carol (1843) was first, followed by The Chimes (1844), The Cricket on the Hearth (1845), The Battle of Life (1846), and The Haunted Man and the Ghost’s Bargain (1848). Each novella was written in a matter of weeks and implicitly or explicitly focused on society’s problems and the hope of redemption. The first three books were very popular in their day and two were almost immediately adapted for the stage. On film A Christmas Carol has been done by famous actors, Mr. Magoo, and the Muppets. The Cricket on the Hearth has been almost as long-lasting on the 19th-century stage and on film. 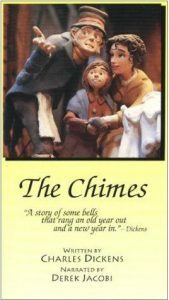 In 1914 The Chimes became a silent film and continues to be presented in other formats. The last two were not as popular in any time period. By the end of the 19th century the story was standard fare for children’s programs. 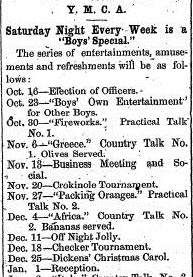 School Christmas programs of the time involved many readings, recitations, and performances; something by Dickens was always on the program. As many times as we’ve read, heard, or watched A Christmas Carol, there is always a new way to experience it. On December 3 join Breadcrumbs Productions and the Geneva Historical Society for “A Christmas Carol: Retold” at Rose Hill Mansion. We all know the story but does the story know us? Performances are at 6 pm and 8 pm. Tickets are $20 per person. Space is limited and reservations are required. Call 315-789-5151 for tickets or purchase online at brownpapertickets.com. This is a show you’ll not want to miss! John, Fascinating mentions of Dickens and his popularity here in the Finger Lakes. Thanks for the post.